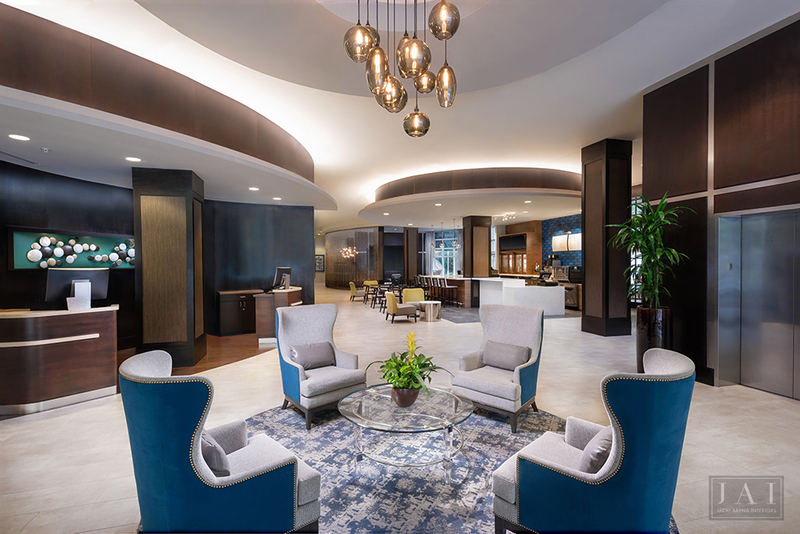 In 2018, we completed this “retro-nature”-inspired public space at the downtown Greenville, SC, Courtyard by Marriott. 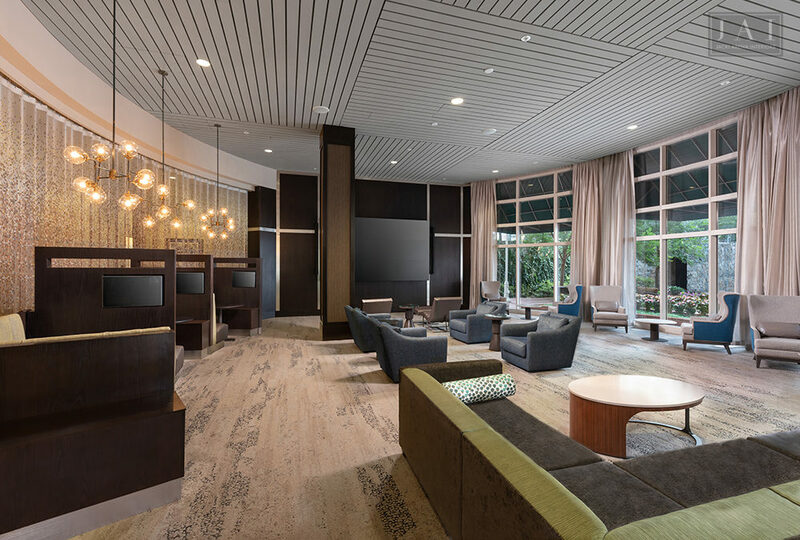 The hotel owner wanted to deviate from the franchise’s brand standards with a modern, open-floor layout, allowing guests — mostly business travelers and the general public — to enjoy space to relax and roam freely. Conscientious of the hotel’s location and surroundings, we designed a multi-functional communal area that reflected the city’s nature-friendly atmosphere; trees, outdoor plazas, pedestrian-friendly spaces, and the river running through downtown. Previously, the first-floor public area was divided by a large TV wall that created three visually separate spaces: an entry lobby, a bar + dining area, and a great room. To open up the area, we reconfigured the oval-shaped bar and backed it out of the center of the room, and removed the massive wall divider. The space now flows as one allowing the guest to do whatever they want, wherever they want. This is perfect for today’s travelers, who don’t want to be “boxed in”. In order to maintain a sense of privacy, an operable, yet decorative chain-link curtain was added to the great room. Guests now have an option to visually screen off space for private events, if needed. The area now pulls the outside in by drawing inspiration from the city’s natural elements. Between Greenville’s trees, the river, and the hotel’s courtyard — which turns into an ice rink during the winter — there was plenty to work with. 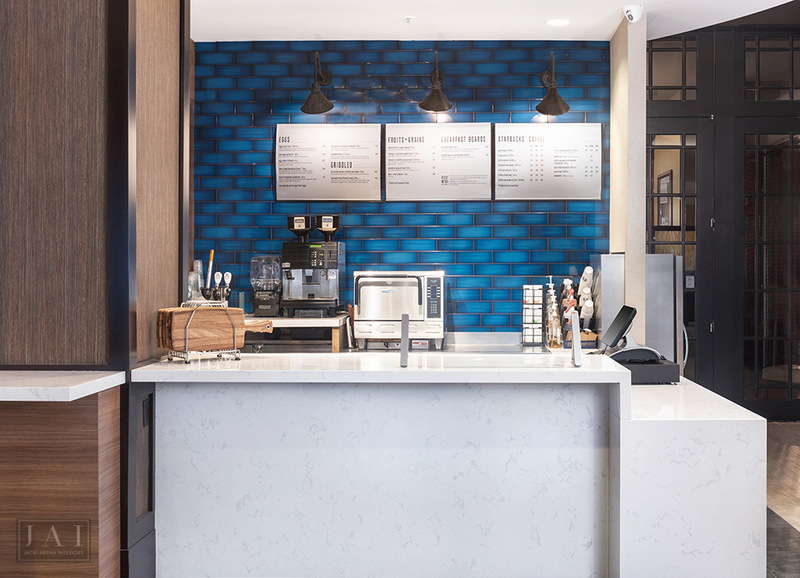 The new bar creates dramatic contrasts through white marble, wood tones, bright cobalt subway tiles, dark bronze and black metal light fixtures, and other accents. To add functionality, the bar now has seating on two sides, as well as a counter for on-the-go convenience that benefits travelers. The original oval-shaped bar was also changed to a u-shape, and a back bar was added to efficiently house liquor storage, menu boards, and TVs. To tie in the “retro” theme, mid-century modern lines were included through furniture selection, along with some traditional curves and patterns; a new media room includes a nine-screen TV wall; the existing dark wood plank ceiling was painted to lighten up the room; and new carpets and porcelain tiles were brought in to refresh the space. 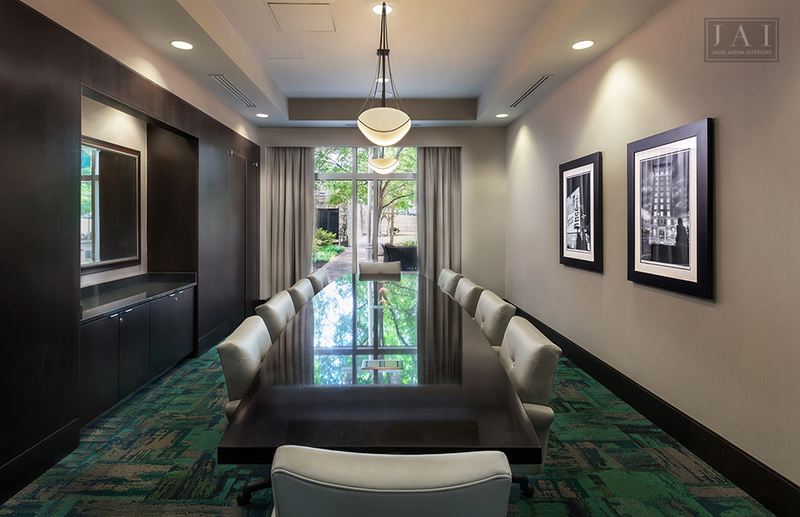 Additionally, the existing boardroom was modernized with a fun, urban carpet print, as well as bold colors that fit the new palette. With this fresh aesthetic, the dark, existing wood elements feel new again. To balance the room, gray walls, chairs, and drapery were added. 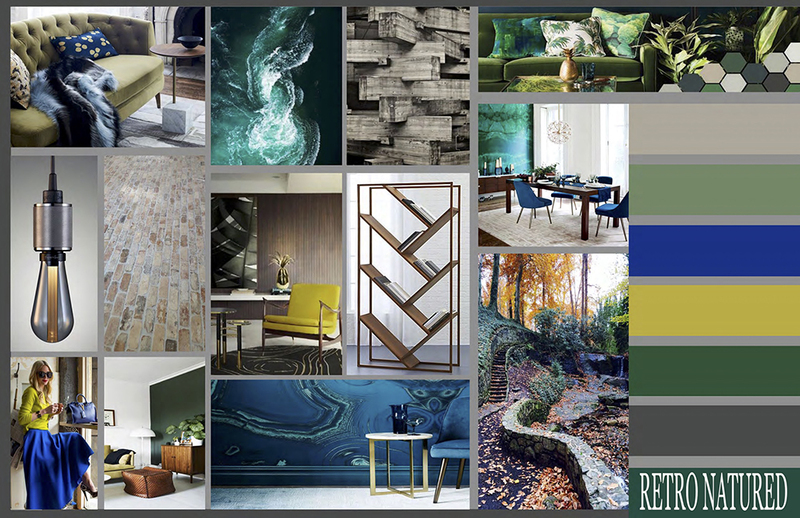 We design for the human experience, allowing the location to be the basis of every story we tell through interior design. In deviating from the corporate brand standards, our client relied on our expertise and entrusted us with this out-of-the-box approach. There really isn’t a substitute for the craft and intention behind Design That Makes a Difference. Right now, the guests of Courtyard by Marriott in Greenville, SC, can appreciate that difference.